Summer has come and gone, and I find myself checking off something that has been on my “Bucket List” for nearly two decades: Living and research at Notre Dame’s Tantur Ecumenical Institute in Jerusalem. I arrived in the Jerusalem late Sunday night, after what felt like a week in transit via Seattle, Vancouver, Minneapolis, Amsterdam and Rome. My first thought, as the Nesher shuttle drove under Montefiore Windmill, is that time flies and I can hardly believe it has already been 5 years since my first visit to the Holy Land. That was a 9-day seminar with the Russell Berrie Fellowship, at the Shalom Hartman Institute. Today, I embark on a 3-month dissertation writing fellowship at Tantur. It has taken three years of working multiple part time jobs (university teaching, research assistant, study abroad residence manager, spiritual advisor, international program staff) to get to the point I could take a few months ‘off’ and actually work full time on my dissertation. I am looking forward to it, but I confess it takes a couple days to adjust to having so much time to work on the one thing I never seem to have time for! Thankfully, Tantur has a library of about 60,000-70,000 volumes on hand, with emphasis on ecumenism and patristics. [By comparison, the Centro Pro Unione in Rome has about 24,000; the World Council of Churches library at Bossey has about 100,000.] The library resources suffered some during the Second Intifada (c2000-2005), and is in the midst of updating its collection – a project I have been asked to help with while I am here, as part of my Fellowship. The roots of the institute go back to the Second Vatican Council and encounters between Paul VI and ecumenical observers, who dreamed of an international theological institute for ecumenical research and life. The famous 1964 meeting of Paul VI and Athenagoras in Jerusalem on the Mount of Olives sparked the notion that this would be the obvious place for such an institute to be established. Before long, Paul VI entrusted the vision to none other than Notre Dame’s president, Rev. Theodore Hesburgh, CSC. 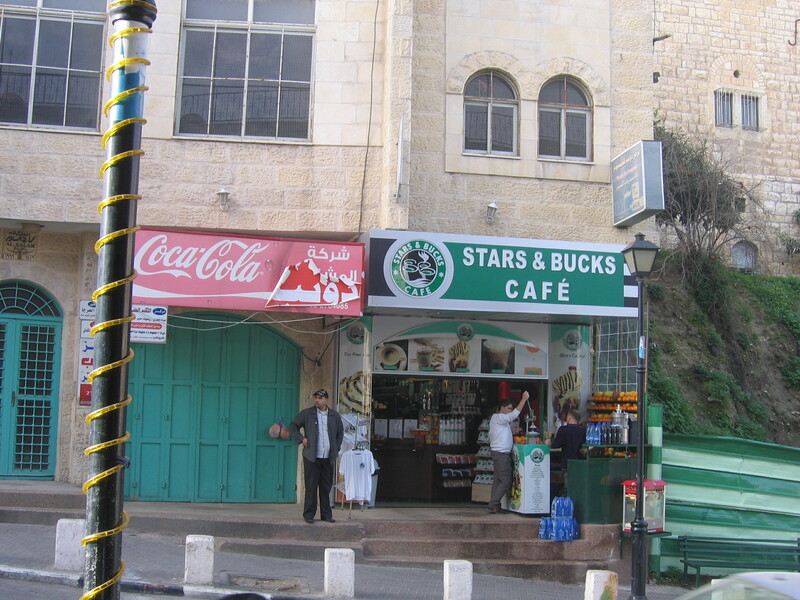 As he looked around Jerusalem, he seemed to find the perfect spot. 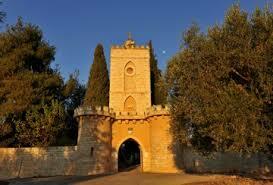 Tantur is located on 36 acres of hilltop olive trees, vineyards, and pine. Overlooking Bethlehem, Gilo, and Bayt Jala, a short drive south of Jerusalem and with the mountains of Jordan visible on a clear day, the location has been understandably described as “strategic”. 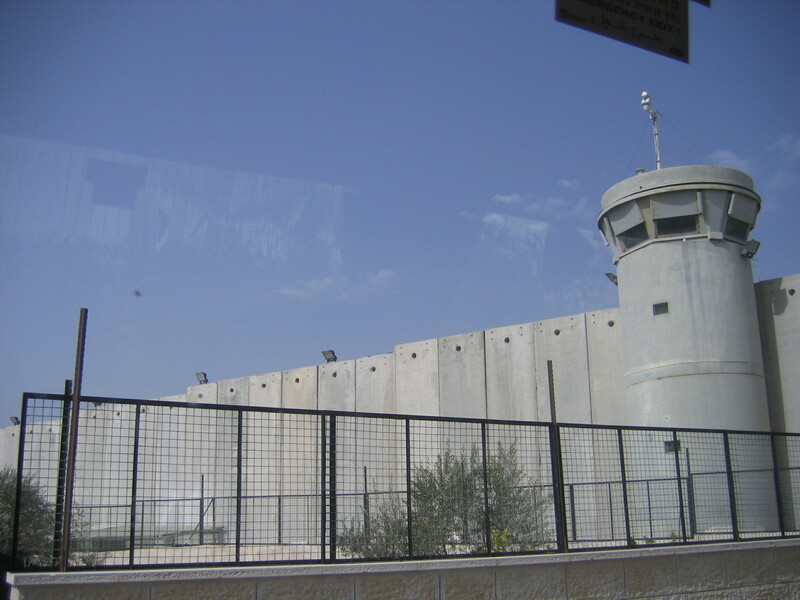 Prior to the 1967 Six Day War, this was Jordanian territory, and is ‘east’ of the Green Line but west of the border fence surrounding Bethlehem. The property itself belonged to the Sovereign Military Order of Malta, at least since 1869, when it was administered by the Habsburg Austro-Hungarian Empire’s branch of the SMOM. During the Ottoman era, they operated a hospital on this site. Apparently, though, there are ties to this land with the order dating back to their first arrival here – in 1099, with the first crusade. Fr. Hesburgh convinced Paul VI to purchase the property from the Order in 1966, for $300,000, just a few months shy of the Six Day War. The initial cost of building the center was estimated at $1 million, for which Fr. Ted looked to the generosity of I. A. O’Shaughnessy (known on campus for having donated the funds for the Arts and Letters College). Notre Dame leased the property from the Vatican in 1967, but building had to wait during the conflict, after which Israel now controlled the territory. By the time the center was constructed in 1971, the cost had doubled. The first year of operation was 1972. Anticipating the renewal of the Vatican lease of Tantur to Notre Dame for another 50 years, starting next year, the University has approved a strategic plan that would propel the Institute to its next phase. The original vision of a resident community of scholars has ebbed and flowed, and most of the people who come through do so either for sabbatical or short term programs, in addition to ND’s study abroad programs in the spring. There are currently three of us considered resident Fellows or Scholars: A Church of England priest, a Jewish biblical scholar, and myself. There is also one seminarian intern/program assistant. There are about twenty people here on a three-month sabbatical/continuing education program, mostly Catholic priests (with two Anglicans). It is easy to envision something like the Lay Centre in Rome as a model for the community life here, with a more explicit focus on ecumenical dialogue. I had finished most of this post at the end of my first full day here; this morning (Yom Kippur/ Eid al-Adha) I heard the news of the shooting death of a 19-year old university freshman at a security checkpoint from a Mennonite peace worker. It is a somber reminder that even as I am here to get away from the distractions of the world to write and research, and as quiet and peaceful as things appear from this hilltop retreat, the complexities of the situation here, and the tragedies, require our prayer for peaceful resolution. And deeper understanding. I am no expert, and I hope the next three months bring me to a deeper understanding and solidarity with my brothers and sisters here – Israeli and Palestinian, Jewish, Muslim, Druze, and Christian. On our penultimate day in the Holy Land we started with a fascinating discussion with David Neuhaus, SJ, director of the Pontifical Biblical Institute in Jerusalem and Patriarchal Vicar for the Hebrew-speaking Latin Catholics in the Holy Land. 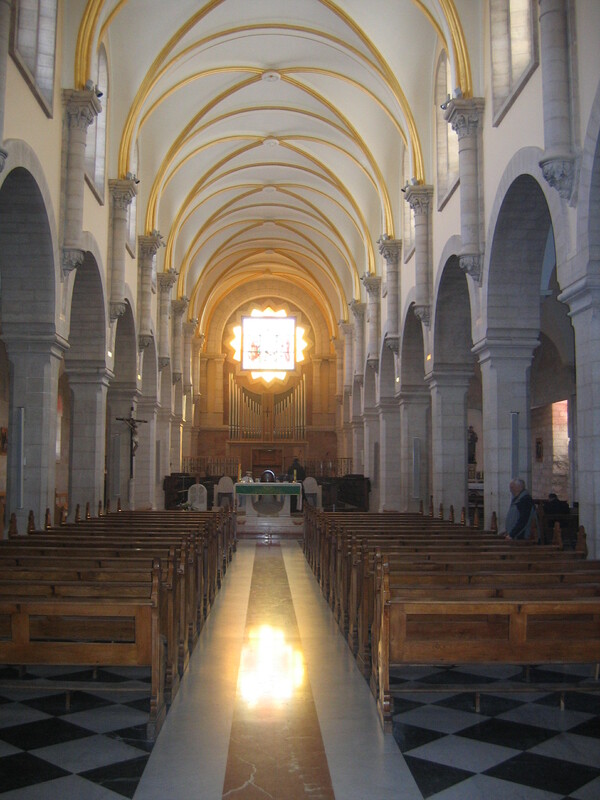 Most Catholics, both Latin and Eastern, are Arabic speaking in Israel, Palestinian Authority, Jordan and Cyprus, the area covered by the Latin Patriarchate of Jerusalem. But, there are also a significant number of Hebrew-speaking Catholics of the Roman church, and he is their go-to guy. It was only a brief overview of the complexities of the church in the middle east. On top of the complex details of the Status Quo ecumenical “treaty” governing the holy sites, the internal Catholic complexities converge with language, rite, church, ethnicity and nationality. And Fr. David has to transverse borders of all kinds in the execution of his ministry. Some of the interesting pastoral notes were the mandatory minimum 2-year RCIA period, often longer, for people converting to Christianity from Judaism or Islam, in large part to make sure it’s a manageable process for the family. Another is the case of Hebrew-speaking Israeli children, at Hebrew schools, where all their classmates are doing Bar Mitzvah. How do you respond when they say they want one too? We then went on our walk through the Old City of Jerusalem, through the Muslim, Jewish, and Christian Quarters, including a stop at HaKotel, the portion of the Western Wall of the Temple Mount which has become the primary site of prayer for Jews in the last couple centuries – the closest they can get to what was once the Holy of Holies in the Second Temple, now the site of the Dome of the Rock. For the evening Shabbat meal, we traveled out toward the Judean desert, in view of the crusader Good Samaritan fortress inn, to Ein Prat Midrasha. The midrasha is a place where young Israelis -mostly after high school and before military service, or after military service and before university –spend four months living in community and studying Torah, philosophy, other religious texts. It seems like a profoundly formative opportunity. We were joining them for their final Shabbat meal together before ‘graduation’, and got there just in time for small group studies. Just before the sun sets, they head out to a bluff overlooking a desert valley, facing west to welcome the Shabbat (the Sabbath), which arrives with the sunset on Friday and ends only when three stars are visible on Saturday evening. This is done first with the singing of psalms and dancing, practices which I think originate in the mystical tradition from around the 16th century. Following this, before the meal, are the more traditional and common prayers that begin the Sabbath. As I commented to one of the students I ate with, the Sabbath practice is one of the great gifts Judaism has for the world, and is especially powerful for my fellow Americans and our intensive, frantic business and inability to slow down much! It was a beautiful evening, and I was blessed to share it with the community here. Morning sessions today included Rabbi Jack Bemporad, visiting professor at the Angelicum, on the challenges of “Facing the Holocaust Theologically and Morally” and Rabbi David Hartman on Zionism and the Challenge of Sovereignty. Catholic-Jewish relations are coming up on a critical turning point. The current generation of leadership at the very highest level of the church is a generation formed by WWII, the Holocaust, the founding of the State of Israel from the former British protectorate of Palestine and the resulting wars, intifadas, and other forms of violence. Pope Benedict was a youth in Nazi Germany. John Paul II was a young man under Communist Poland. But for me and my generation of peers both Catholic and Jewish, these are historical events. Important, yes. The Holocaust cannot be forgotten lest genocide be allowed to happen again, as it has too many times this century. But they are not experienced events. They did not shape our identity, and the future of Catholic-Jewish relations will not be able to sustain the Euro-centric focus that has dominated it for the last few decades. What happens when we elect an African pope (or Asian, or one from the Americas? ), especially one who is now 60 or younger? It might not be at the next conclave, but it will happen. Thankfully, the conversation is already started. Rabbi Hartman’s quote of the morning, “Weakness invites violence; strength invites dialogue” indicated that this is not the kind of interfaith meeting between reform rabbis and liberal protestant pastors that are familiar back home! Politics cuts different lines here, but religious dialogue needs to continue, including if not especially from the more traditional parts of our respective religious bodies. After the presentations, we concluded with a celebratory meal and ‘graduation’ ceremony. It has been an intensive week, but far too short. We are left thirsting for more – which I suppose is the idea – rather than having questions answered, I have come away with more questions than with which I arrived! The afternoon schedule was something I had been looking forward to and dreading at the same time, a visit to Yad VaShem (the Holocaust Martyrs and Heroes Memorial and Museum). We were honored to begin with meeting Dr. Ehud Loeb, a survivor from Germany and member of the committee on the Righteous Among the Nations. The committee singles out and recognizes people or organizations who risked their own lives and safety to rescue Jews from the Holocaust, using rigorus documentary standards. Dr. Loeb’s own life was saved by several people at various points, including five now honored among the Righteous. It has been almost 14 years since my first visit to the United States Holocaust Memorial Musem, and it remains one of the most powerful experiences of my life. It took me over four hours to make it through, and much longer to process it all. I anticipated Yad VaShem to elicit a similar response. Unfortunately, you cannot do something like this on a schedule, and I am skeptical even about doing it with a guide or a group. The museum is in itself excellent, powerful, evocative. But we did not have enough time to experience it all, or to process it afterwards, or discuss the content – including the controversial panel on the “Silence of the Church” and Pius XII. I will go back to Jerusalem, even if just to get the full experience there sometime. Rabbi Bemporad did take the opportunity at that point in the tour to make clear his objection to the treatment of pope and Church in eloquent and informed terms – unfortunately our guide was not one of the historians or otherwise responsible for the content. That would make an interesting debate – “Hitler’s Pope” [sic] as understood by different Jewish voices. This was part of the discussion during Pope Benedict’s visit last year, and the recent opening of more archives to allow all scholars access to information regarding Pius’ actions during the Holocaust. Dinner was at the Motefiore estaurant, in the shadow of a Motefiore’s Windmill (or, as we dubbed it, the Dutch Church/ St. Eveline’s). An interesting neighborhood history, with him having to pay Jewish settlers to live outside the city walls during the waning Ottoman occupation in the late 19th century. One of our guests was artist Avner Moriah, who gave us each prints out of his newest series of work, “Genesis”, featuring Abraham taking Isaac up to Mount Moriah for his sacrifice. I got to sit between two post-modern Jewish philosophers for dinner – and there are not that many, I hink! The Shalom Hartman Institute, which is serving as our academic centre for the morning sessions of our seminar in the Holy Land, was founded by Orthodox Rabbi and Professor David Hartman in the 1970’s and named for his father. It serves as what we (Christians) would call an ecumenical centre of education, bringing together Jews from almost the entire range of thought and life – Modern Orthodox, Traditional, Reform, Liberal, Secular, and a few that defy customary categories. It serves as a centre for the continuing education of Rabbis, has two high schools (boys and girls separate), and several research fellows and innovative education programs, including the intensive week seminar that serves as part of my Russell Berrie Fellowship in Interreligious Studies. This morning’s first session was with the founder’s son, Rabbi Donniel Hartman, continuing the themes of membership and identity, the differences between these questions being addressed in Israel and in North America (where the largest population of Jews live). We then engaged the question of feminism in Judaism, especially as it is being dealt with in Orthodox Jewish congregations, and how it relates to other movements. The afternoon we spent in the neighborhood of our hotel, known as Mt. Zion (though historically, the original reference to Zion was probably the temple mount in the City of David, and this Mt. Zion took the name later). 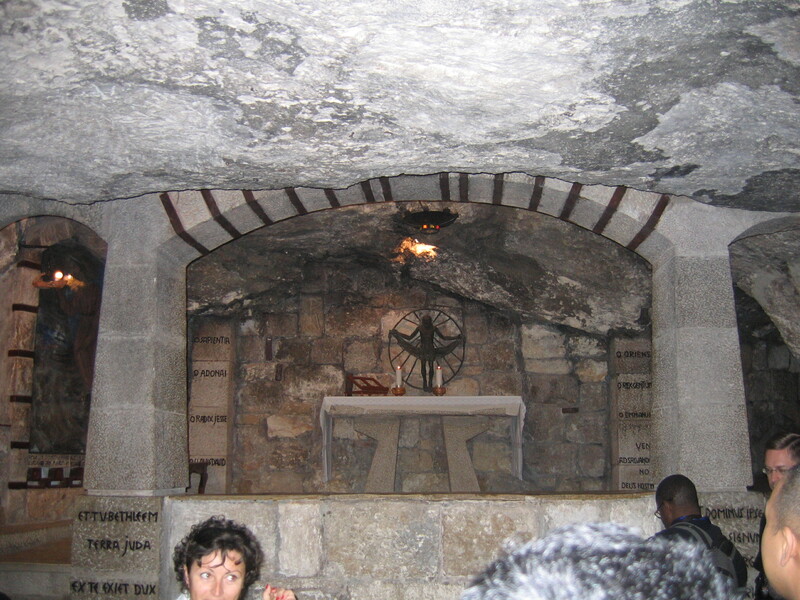 We started at a holy site that is simultaneously holy to all three major monotheistic religions, including the Last Supper Room and Pentecost shrine, which was at one time converted to a mosque, and the Tomb of David. 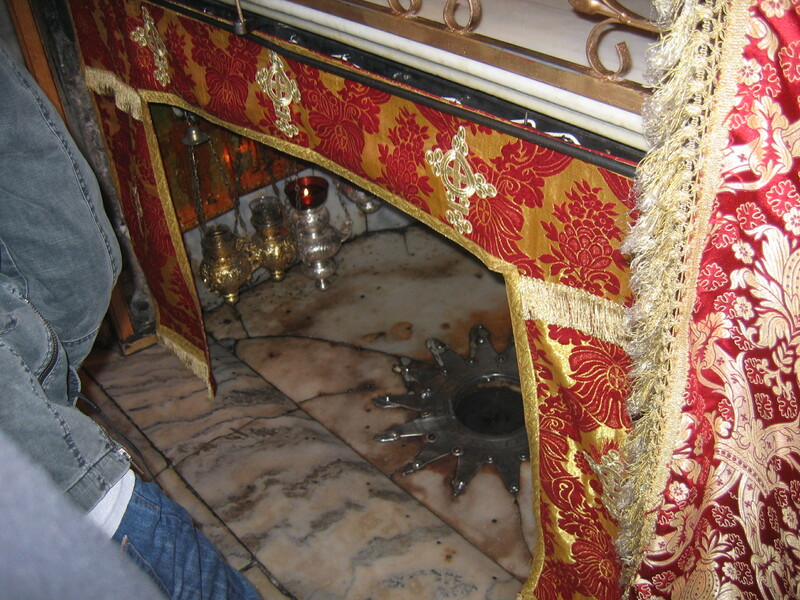 Nearby we stopped by the Church of the Dormition of Mary and the Church of St. Peter Gallicantu (the rooster sings), commemorating the denial of Christ by Peter and including what is thought to be Caiphas’ house. 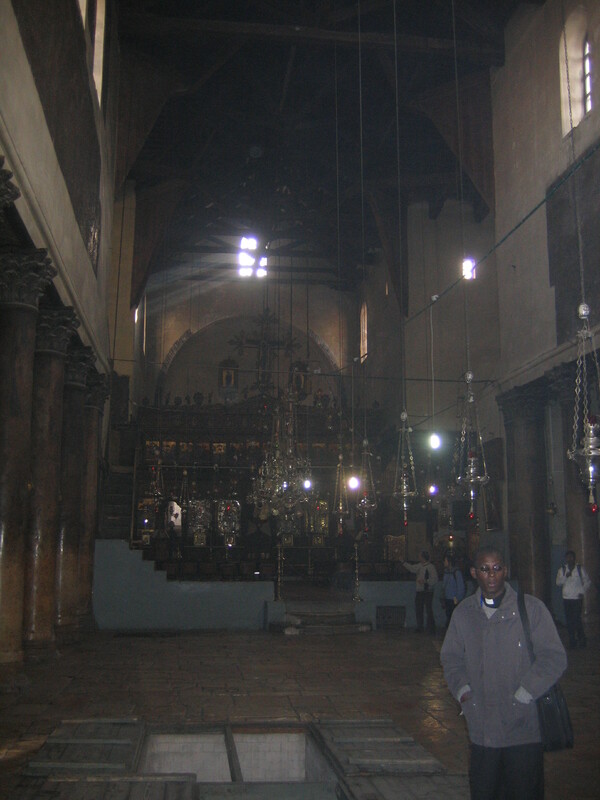 The organ at the church of the dormition was being tuned while we were there, adding an eerie tune to the background while meditating on the mystery of the resurrection of the body.